If you've been following the 12 Gifts of Christmas Blog Hop, the brainchild of Jennifer at Ellison Lane Quilts, I'm sure you've added some adorable gifts to your Christmas to-sew list! I've seen some very cute ideas and I can't wait to make some of the adorable gifts featured. 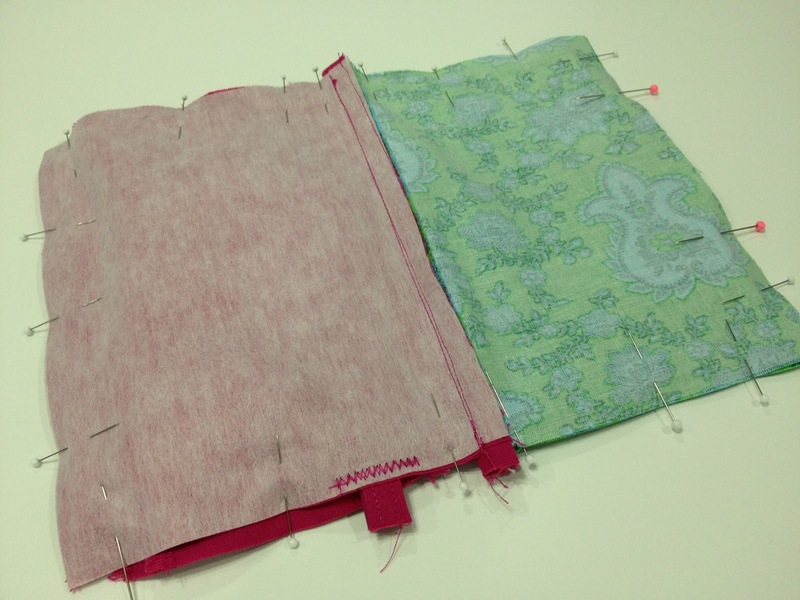 This wristlet can be made with one fat quarter (FQ). Advantage, it's ONE fat quarter. Disadvantage, the entire wristlet is made from the same fabric. 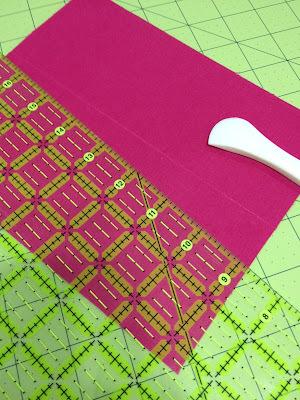 Use the cutting layout below if you want to cut the entire thing from one FQ. 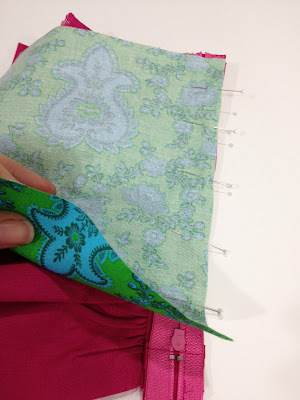 To make it from different fabrics, use the measurements on the layout to cut your pieces. Or, you could make two or three with two or three FQs and mix the fabrics up. Optional: Two 8 x 6" rectangles for a contrasting lining if you don't cut the lining pieces from the FQ. Step 2: "Hem" the ruffles. There are, of course, a variety of ways you can finish the edges of your ruffles, but to keep this simple, we're going to zigzag about 1/4" inside the edge and unravel the fabric a bit. I use my seam ripper to pick the warp threads one at a time and pull them out. I used a zigzag stitch 2.5mm long by 3.5mm wide and unraveled my edge back to the edge of the zigzag. Step 3: Gather the ruffles. 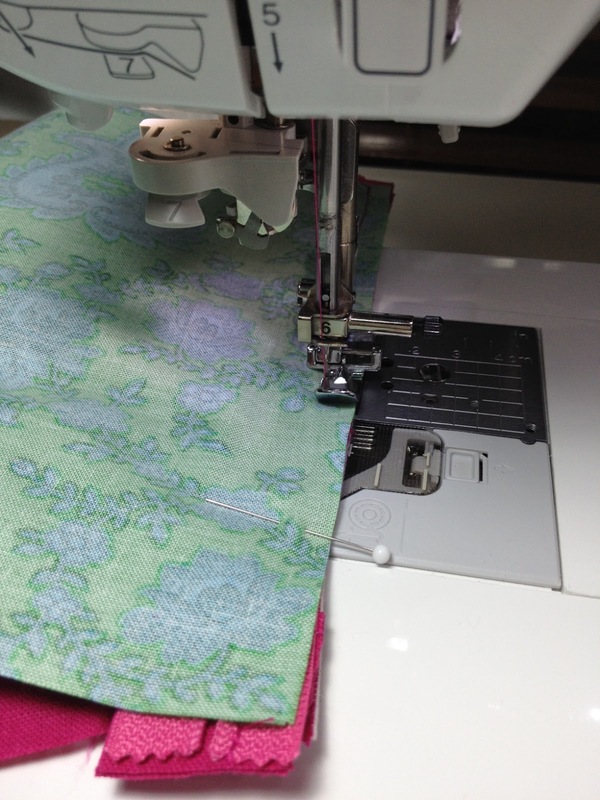 Sew a basting stitch (the longest stitch on your machine) along the top edge of each ruffle. Then sew another row of basting stitches about 1/4" below the first row. Be sure to leave at leave at least 2-3" of thread tails on both ends of your ruffle. I used white thread so you can see my basting stitches. 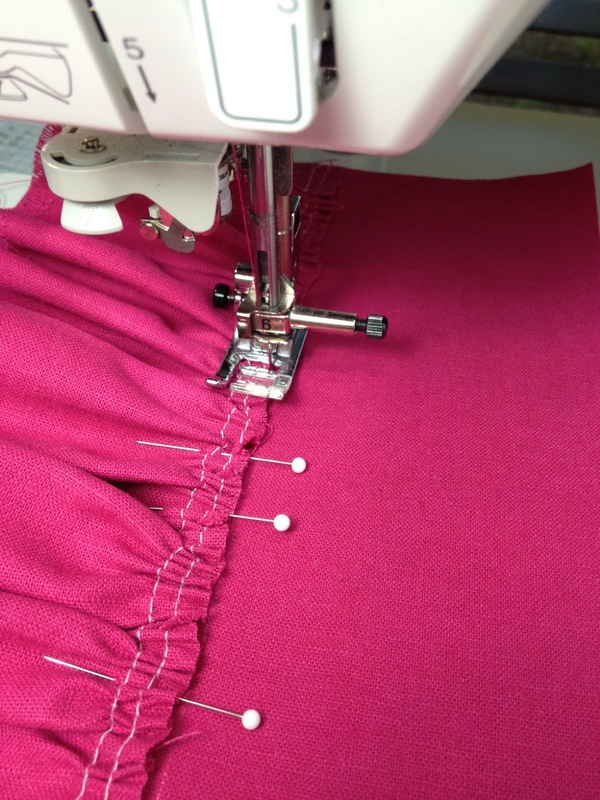 To gather your ruffles, pull on both bobbin stitches on one end at once and gently gather the fabric. I like to push a few small gathers all the way to the center and build the gathers out toward the edge. 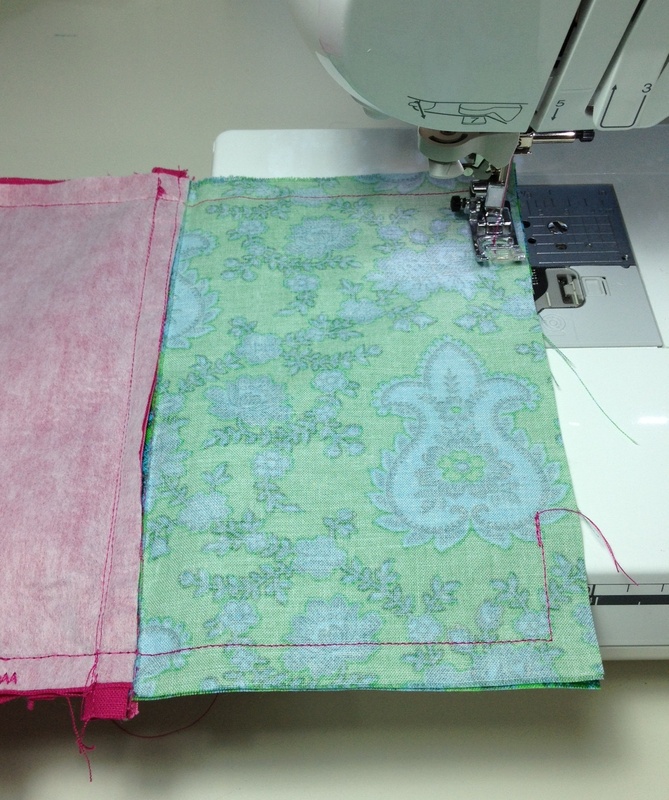 Do the same on the opposite end until your fabric is gathered to about 8" wide. Gather both ruffles. Step 4: Attach the bottom ruffle. 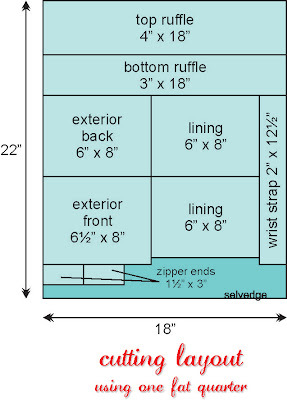 Measure 3.5" up from the bottom edge of your larger (6.5" x 8") exterior fabric and mark a line along the 8" length. I used a hera marker, but a pencil would work just fine. 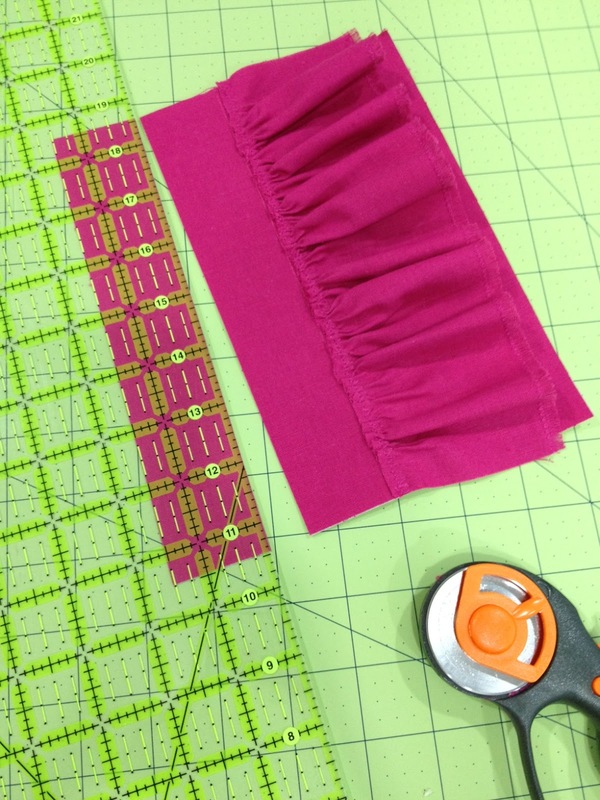 Align the top edge of the smaller (3") ruffle to the line you marked. 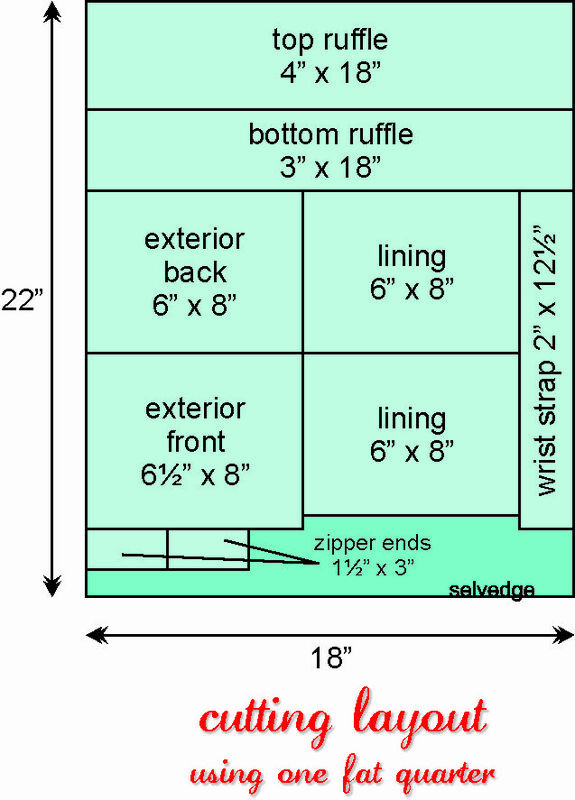 There will be 1/2" below the ruffle. 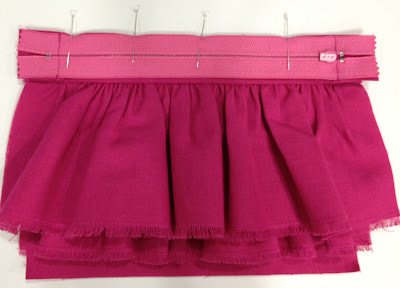 Distribute the fullness evenly and pin the ruffle to the fabric. 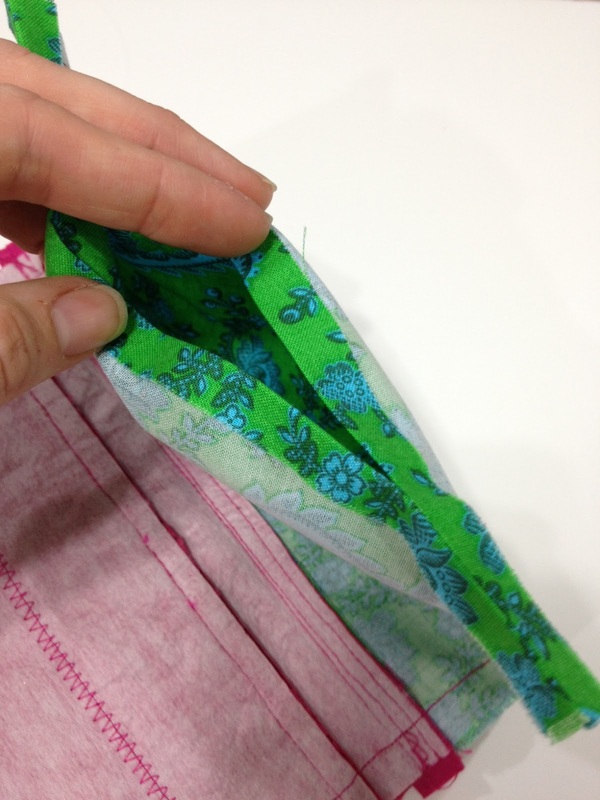 Stitch the ruffle to the fabric with a straight stitch 1/8" from the raw edge. At this point, I remove the basting stitches. If you basted with the same color thread and they aren't loose and their appearance doesn't bother you (they will be hidden under the top ruffle), feel free to leave them in place. 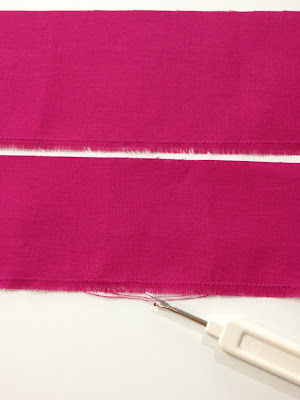 After removing the basting stitches, sew a wide zigzag stitch about 1/16" down from the raw edge. It helps contain the yarns along the raw edge and keeps the top edge of the ruffle flat. I used a zigzag stitch 2.0mm long and 5.0mm wide. Step 5: Attach the top ruffle. Trim 1.5" from the top edge of the exterior front. 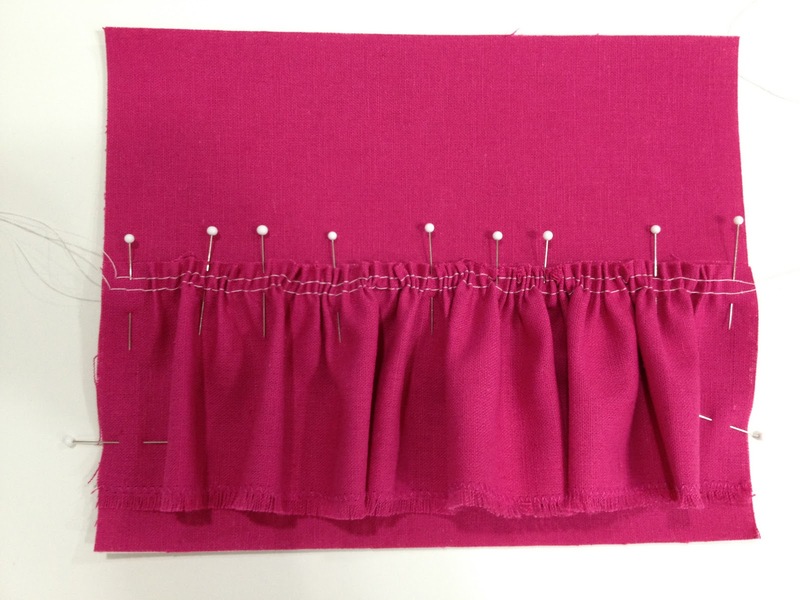 Align the ruffle to the top edge and pin in place distributing the fullness evenly. Stitch this ruffle to the bag front using straight stitch and a 1/8" seam allowance (or a VERY scant 1/4" seam allowance). Place the 1.5" strip you cut from the top edge of the bag front right side down on top of the ruffle and align the top edges. Attach this strip to the bag front with a 1/4" seam allowance. Fold the strip up and press it away from the ruffle. If you have any stitches, basting or otherwise, showing along the top edge of the ruffle below the strip, remove those carefully with a seam ripper. Step 6: Cover the ends of your zipper. Fold each small 1.5 x 3" rectangle in half to form two 1.5" squares. Press each square and align it (folded edge to the inside) over the ends of the zipper covering the metal zipper stop on each end by 1/8 to 1/4". Stitch over the end of the zipper in that small space as shown on the right below. 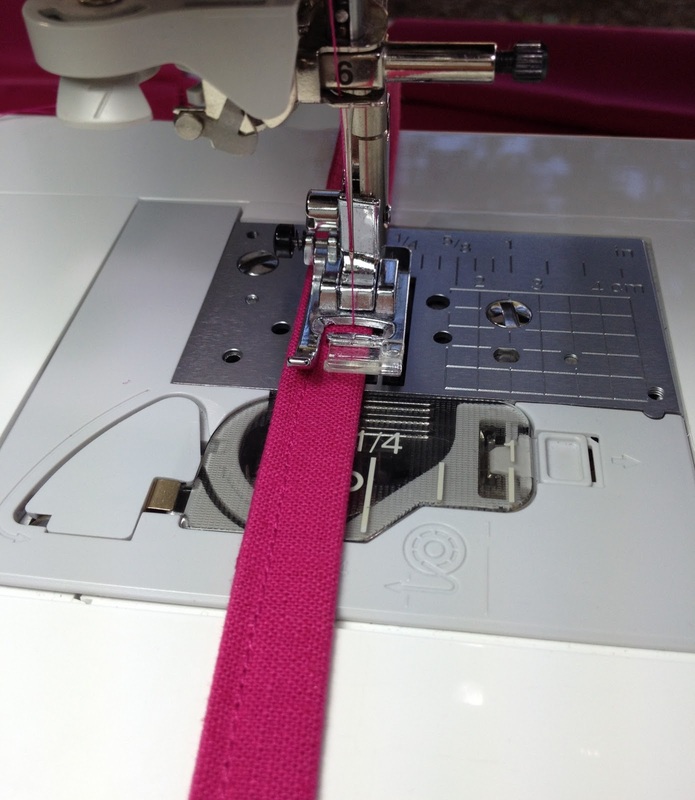 Take care to avoid the metal zipper stop; your machine needle probably won't win against it. Stitch both ends and flip it over to check out how fancy your zipper looks now. 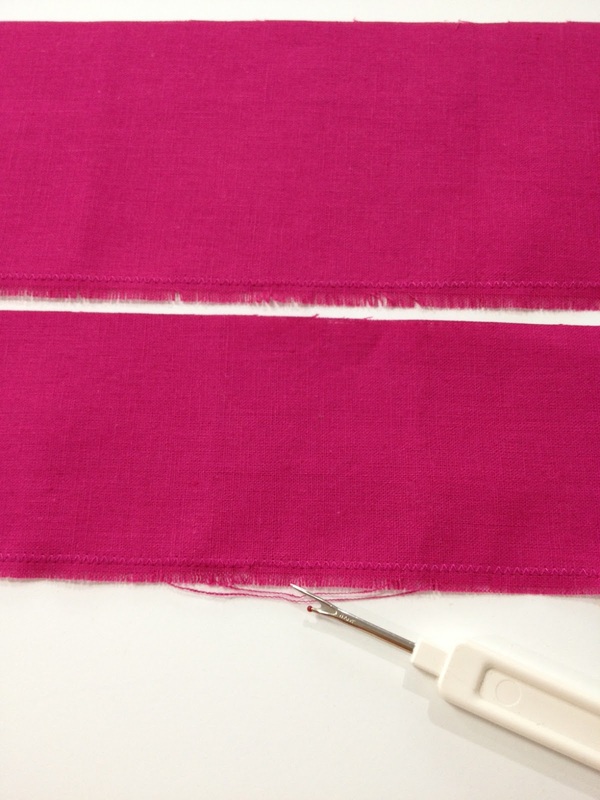 Trim the fabric on the ends and sides so that it's the same size as the zipper. Step 7: Zipper Time! Center the zipper right sides together on the top edge of the bag front. It will be slightly longer than the fabric. 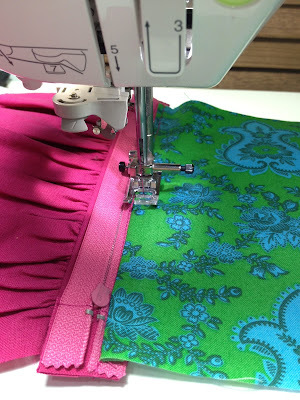 Use a zipper foot to stitch the zipper to the bag. Start on the end opposite the zipper pull with the zipper closed. Sew to about 2" from the zipper pull, lower the needle, and raise the presser foot. Reach under the zipper and push the zipper pull backward past the presser foot. 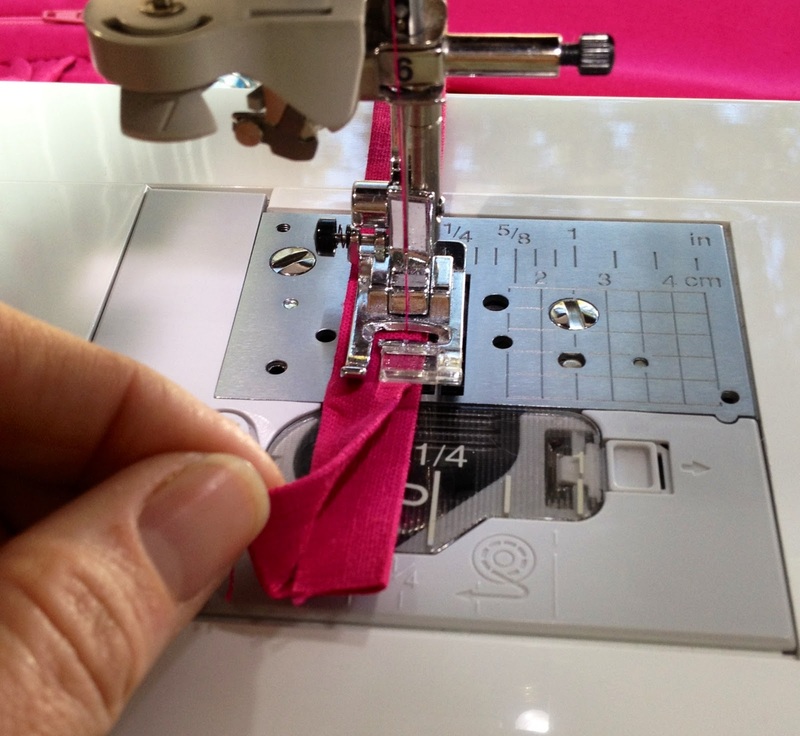 Lower the presser foot, ensure that the fabric edges are still aligned and finish the seam. I totally forgot to take a photo of this step, so I faked it in the photo below, but I had already sewn the seam. You only need to stitch it once; don't let the photo confuse you. Close the zipper and place one lining piece right sides together on top of the zipper and bag front, aligning the top edge and sides. Pin and stitch the lining to the zipper using the zipper foot. You won't be able to see the zipper, but your zipper foot will be able to find and follow the edge of it through the lining. 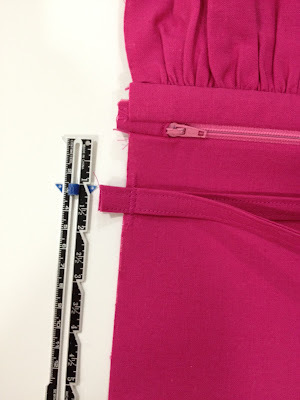 Move the zipper pull to the back in the same manner as before to ensure your seam is straight. Open out the lining fabric and press it away from the zipper. Understitch the zipper to the lining to prevent the lining from being caught in the zipper teeth. Stitching will only go through the lining and the zipper, not the front of the bag. 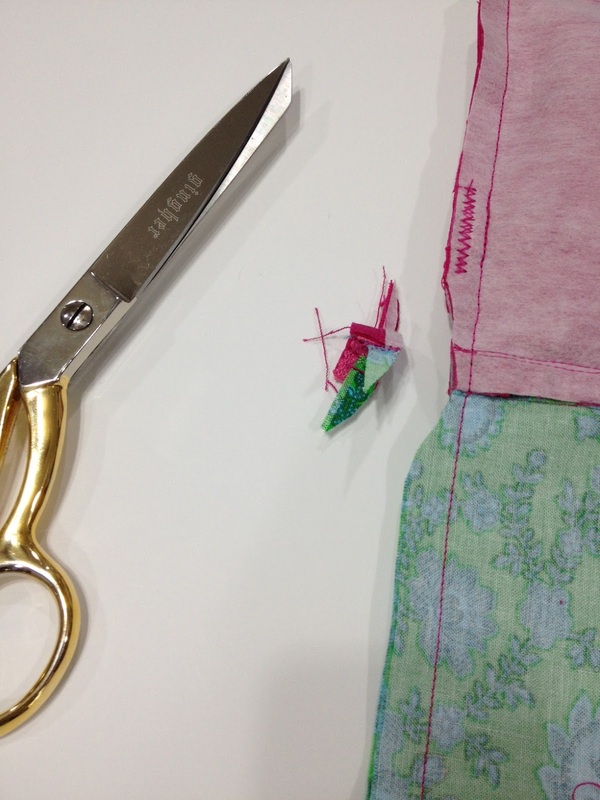 Be sure to pull the fabric gently away from the zipper as you stitch. Repeat Step 7 to attach the other side of the bag and lining to opposite side of the zipper. Don't forget to understitch the lining and press all of the seams when finished sewing. Step 8: Wrist Strap: Fold the wrist strap in half lenghtwise and press. Unfold it and fold each outside edge in to the center fold and press again. The raw edges are hidden and the strap is four layers thick. Sew close to the edge along the length of both sides. Secure the wrist strap to the edge of the exterior back (only the back, not the lining) on the side where the zipper closes, about 1" down from the top edge. I used some zigzag stitches which will be hidden inside the seam allowance. U N Z I P T H E Z I P P E R H A L F W A Y! I don't know if you've ever tried to unzip a zipper from the back side, but it's so hard to do, I don't even know if it's possible. So, please, please don't forget to unzip your zipper half way or about four inches. Fold the bag so that the right sides of the exterior and lining are together. The seam allowances at the center (the zipper) will fold toward the lining. Pin the bag together on all four sides, matching your edges and corners. If the bag is a little crooked at this point, take a moment to square it up. 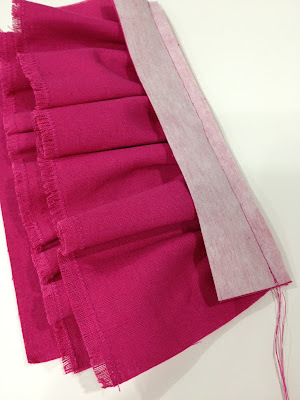 Make sure that the sides of the ruffles extend out past the edge of the bag to ensure they are caught in the seam allowance (see mine sticking out on the sides below). Leave an opening in the center bottom of the lining about 4" long. My opening is marked by the pink pins. Stitch all the way around the bag with a scant 1/2" seam allowance. Make sure that the ruffles are pushed back out of the way of the bottom exterior seam. Before turning the bag right side out, press the seam allowances at the bottom of the lining (the edge with the opening) back on to the wrong side of the lining. This will make it easier to sew the lining closed. Clip your corners and trim the bulk off the seam allowances at the zipper ends. I also trimmed back the ruffles and the end of the wrist strap. It's the big reveal! Reach inside the opening in the lining and turn your bag right side out. Use a point turner (or a chopstick) to push the corners out from the inside on both the lining and the exterior and inside the corners formed at the ends of the zipper. Step 10: Sew the lining closed by machine or by hand using a slip stitch. All finished! So, are you ready for a giveaway? 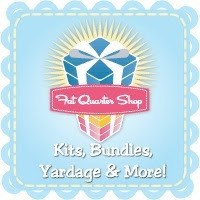 How does a $25 gift certificate to Fat Quarter Shop sound! Leave a comment on this post and I'll draw a winner at random on October 27th. But, it gets better! Even if you don't win the gift certificate, everyone is a winner at Fabricworm who is offering a 15% discount to readers of the 12 Gifts of Christmas Blog Hop! Just use the code fw12days at checkout. GRAND PRIZE of a $250 gift certificate to Fabricworm! I'm really grateful that Jennifer asked me to be a part of her blog hop. Be sure to check out all the great tutorials above, and enter their giveaways if you haven't already. Happy sewing and best of luck on the giveaways! Adorable!! This would be great for quilt show shopping! 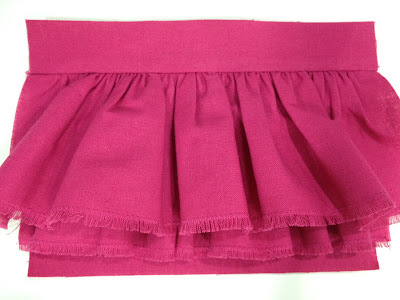 Or, for my niece who loves ruffles. Thank you for the zipper instructions and detailed pix! This is so pretty! I love the edge on the ruffles. Loving the look of this. :) Thanks for the tutorial! Awesome! I love the fabrics you used too. I will definitely be pinning this! Thanks! Yummy project and a great tutorial!! This is a cute wristlet and a WONDERFUL description of how to make one. Thanks for sharing it with us! Looks easy! I'm a bit zipper shy so something like this would be good practice. My granddaughters will love these. Christmas is coming! I love this wristlet - a must do project for the grandaughter - thank you so much. You are adorable by the way! So cute and such an awesome tutorial Melanie. Thanks so much for being a part of the blog hop! PS: I love your blog background! Pretty. Thanks for the toot. I love the frayed edges! Wow, Melanie, love your tutorial. Such sweetness, so girlish. Great pictures. Isn't that just cute? And it looks very do-able, zipper and all. Thank you for the lovely tutorial! Great tutorial. Perfect amount of detail and great photos! Cute! I always learn something new. 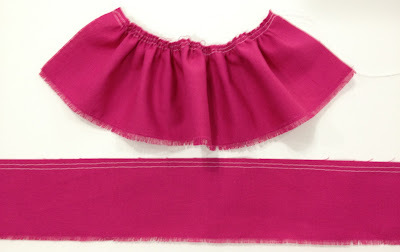 In all my years of sewing, I have never sen a ruffle finished off with a zigzag stitch and unraveled a bit. Clever. So cute and an excellent tutorial! Thanks for another great gift idea! This looks like a great present. I'm thinking I'll make it in red. Thanks. What a quick and easy project! Thanks for your time. I love the ruffle edges. This will be perfect for my DD to take to work. I'm sure all the other girls there will want one, too. Thanks for a great tut! Thanks for a great tute. This is gonna be my first zipper. This is a really cute clutch. Thanks for the tute. Thanks for the great tutorial. I think that my daughter and daughter-in-law would really like one of these. Very cute!! I just may have to make one for myself! a great gift for my dggd, a preteen who thinks she's 16! your toot looks easy to follow, and will do so. thanx! So wonderful - thank you. Cute cute idea! Great gift idea! Such a cute little wristlet! It's so elegant! Too elegant for me I'm afraid but it will make a lovely gift for one of my friends. This will look so cute on her! Thank you! Momma gives two thumbs up on this one! Waaay cute! Wow, what a cute wristlet. I love how you included the cutting diagram. Thanks for sharing! Those ruffles are just the right touch to make this bag stand out. Love the raw edges. I have some dupioni....hmmmmm. would love a chance for the gift certificate - with sales coming up after Thanksgiving this would come in handy! OK, so now I have 4 year old twins desperate for one of these each! Lovely! Thanks so much! It is a fun project! wow this is a cute bag! Thanks! The pictures are great! Thanks for the tutorial. Totally darling wristlet! Love this! What a great idea! I can think of several combinations for this little jewel. This is an adorable little clutch! Very sweet and girly. What a pretty clutch, and a great gift idea! THANKS for sharing! That is so adorable, thank you. cute wristlet. love the ruffles! Oh the possibilities! So cute. thanks for sharing! This is adorable! I must make one!!! Or 12! Cool project. I'm going on a quilting cruise in 2 weeks and this would be perfect little purse for the formal nights. thanks for the clever tutorial! fun project, great tutorial =thanks! Pretty bag! Thanks for the tutorial! Oh my gosh. Super duper cute. Can already think of a list of people to make this for. Thanks so much for sharing! This tutorial is great and understandable! Thanks! This would actually be probably a cute gift to give a girl who loves pink, and someone who loves accessories like my husband's niece. Love the ruffled wristlet pattern. I think I need to make one for all the girls on my Christmas list! This is very cute. Love the ruffles. Thanks for the tutorial. Wow! You write great tutorials! I'll be back to visit your site again. I love wristlets and the ruffles on this one are just too cute. I want to make me one in grey! Thanks for sharing with us. Oh how smart. I like the Idea of mixing up fatquarters and making several. Cute bag, great tutorial. Thanks for sharing. Thanks so much for sharing this charming idea. I absolutely LOVE the color wheel quilt at the top of your blog! Great tute - cute present. And who wouldn't want to win a FQS gift certificate - thanks for the chance! This is really cute. Of all the wristlet tutorials out there, the raw-edged ruffle really makes this stand out. Thanks! Thank you for the great tutorial and the giveaway! Oh what a cute purse!!! Thank you for a great idea. Great tutorial the zipper part so clear. Grand daughter gets this one. Super cute! Thanks for the great tutorial! Wow! That looks like an ideal gift for a few of the girls on my list! :) Thanks for the the tutorial and giveaway! Great tutorial. I haven't tried anything with ruffles yet, though this looks pretty easy. Thanks! Woo woo, that would be nice! I've tried to unzip from the back before... not fun! :) Cute wristlet! Wow my daughter would love one of these. So adorable. Thanks for sharing this great tutorial. Such a nice tutorial! :) Thanks for the chance to win! What a neat tutorial! Love the wristlet! Adorable! Thank you for the fab tute! Adorable! My daughter will love it! Wonderful tutorial - nice clear instructions and clear pix, too! I want to try this with some contrasting fabrics maybe...got it bookmarked! Thanks for the chance to win! That is so cute, I have to make one for Quilt Market next week so I don't have to worry about carrying a big purse. Thanks! And on another note, I love the side bars of your blog: all those lovely fabric prints!! Where did you get them, or how did you get them done? Love this! This will make some great christmas presents! I want to try making this altho I am not a seamtress (but I am a quilter!) Your clear photos & instructions give me hope! Great tutorial -love the frayed edge on the ruffles. Love this sweet little wristlet! How lovely A cute little wristlet with style. What a great tutorial, thanks for sharing this. I can't wait to make one. I love this bag. So cute. Thanks for participating in the hop. whoa, thanks for taking that zipper step slowly...im perplexed by zippers. cute bag for sure. I love the "fringed" ruffles! That zipper instruction is great- I'm still getting my head around them but this would make great xmas presents for my girlfriends! Oh I love this wristlet!! It would make a great gift! Thanks for sharing! How cute! Thanks for the wonderful tutorial and for the opportunity to enter your great giveaway. I hope I'm not entering 2x. I just left a comment and it said there was a problem then it said it was accepted but when I look for it, it's not to be found. This is the perfect gift for my granddaughter. Thanks for the thorough tut. Now that little wristlet is so sweet. I love the quilt in your header. This is so girly and pretty! Thanks for the tute! What a great idea. Now I know what to make for those "teen" girls on my list, not to mention the 5 year old. Thanks so much for sharing your talents. Cute!! I might have to make this for my daughter! Woohoo! Look at that, perfect for all my nieces and only a fat quarter (BONUS). Thanks! Cute idea for a wristlet! Thanks for the tutorial! This is really cute! I've never seen one with a ruffle that wide- really unique!! Thanks for sharing! cute!!!!! and thank you for all the great pictures of the zipper install! Fun project and great tutorial. Thanks for sharing your talents with us. That wristlet is so cute. I can see some little girl (or big) loving those ruffles. I love the ruffled wristlet! It's darling! Thanks for the giveaway. i really like the frayed edges on the ruffles - hadn't thought to do that, but it's seriously cute! Thanks for the tutorial for the lovely wristlet. I like the colors. What a cute wristlet! I love it! Maybe if I have time, this may be my homemade to the women in my family this year... thank you for the wonderful tutorial! That is so adorable! and who doesn't love ruffles!! Thank you! Thanks for the tutorial and being in the blog hop. I've enjoyed all the tour! I'd love to be entered. Thanks for a chance to win! Great tutorial! Thanks for the tutorial. Very easy instructions! And thanks for the giveaway chance. What a cute idea! Thanks for the instructions and giveaway. My niece would love it! Thank you for the wonderful tutorial. Oh my goodness this is great!!!!!!! Thanks so much! Great tutorial! I love your blog background. I think I have visited before - is it new? So cute! I'm glad you added a cutting diagram, too. How cute! What a great tutorial. I just made a zippered pouch today...the way you made this is new...I really like the idea. Ohhh I must make this for myself :). Oh how cute is this little bag. I know several young ladies that would love this. The ruffles are just that little extra detail. Very sweet. What a cute purse! Love it! Thanks for a great giveaway! This is so cute! 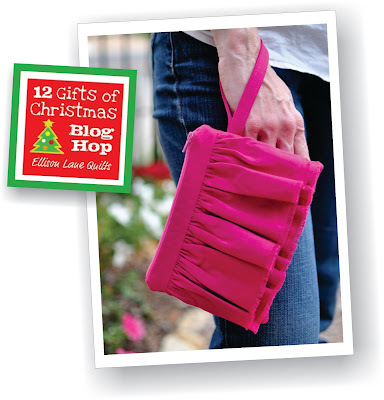 I have the perfect person on my Christmas list for this ruffled wristlet! Thanks for the tutorial! What a fun little purse, great for the girls, they would love that. So cute! Would love to give this a try! Love your tutorial! Would make great gifts too. Very cute and I love that you can make it out of just one fat quarter. I love, love, love your blog and the tutorials are awesome. Thank you for sharing! I love a ruffle :) Thanks for the great tutorial! Cute wristlet, the instructions are very clear. Thanks. oh how cute it is! thanks for sharing this one. I know a person who will love it if I make it for her and my GD. Wow! I really love this! Too cute! Thanks for sharing! SO cute! Love the ruffle! My daughter and nieces will love this. Thanks for sharing, and the giveaway! Thank you for the cute tutorial! I love that ruffle on the little purse. wow - gorgeous little purse - thanks for the tutorial - I'm sure my nieces will enjoy this one. I gotta make me one of these!! Very cute. Thank you for the tutorial, I'm going to get going on this first thing tomorrow. Thanks for a lovely tute, how cute! That's so cute, thank you. What a pretty way to use up some leftover fabric or a special FQ. I love it! I have been wanting to try a wristlet for a while now. This is a perfect time. thanks for sharing. Love it and all the ruffles. Great gift idea. Thanks for tutorial. I love the ruffle! too cute - thank you! That would make a perfect item to carry during the holiday parties! Thanks for the clearly written tutorial! How Cute! I think I could do this :D and I am off to check out the rest of the blogs too! thanks so much for the splendid tutorial! I have never put in a zipper. I need to do this tutorial just to see if I can. It is a little scary. Very cute! Love the ruffle. Fun project for my neices! Love the ruffles. Thanks for the chance at your giveaway. I love the ruffles. My daughters will love this. Thanks for the tutorial. My Grandlittles would adore these! Such a fun tutorial and a great way to use up small pieces of fabric! And it looks like I might even manage it. Thanks for taking time to share this and for the fun giveaway. Cute wristlet! Thanks for the chance to win! Thanks for the tutorial. My daughter would love this. Very cute project. I know my college age daughter would love one. I better get busy. So very cute! I could see myself using one of these.